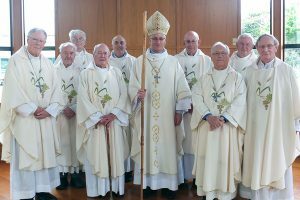 WelCom November 2017: Several priests and two brothers from the Palmerston North Diocese were joined by family and friends to celebrate significant jubilees at a special Mass at the Cathedral of the Holy Spirit on Tuesday 10 October 2017. 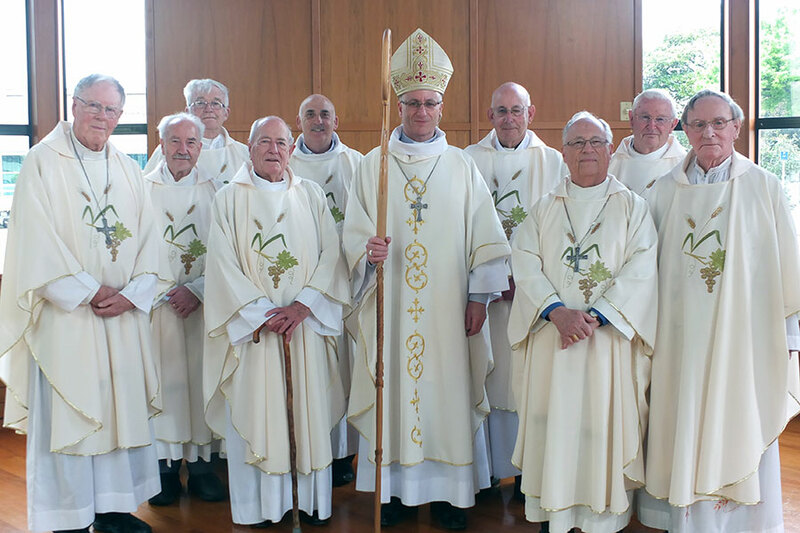 The priests included: Fr Joe O’Sullivan (60 years); Fr Fergus Reeves (55 years); Fr Terry Carr (50 years); Fr John Mori SM (50 years); Fr Dominic Heslin (55 years); Fr Joe Grayland (25 years); Fr Paul Kerridge (55 years); and Fr Kevin Neal (25 years). Also included in the celebrations were Br Bill Archer sm and Br Raymond Kelleher sm, from Napier, both celebrating 60 years. Fr Dominic Heslin was unable to attend. After the Gospel reading (Jn 15:9-17) Fr Paul Kerridge reflected on the significant changes to the Mass since he first became a priest. He said that the priests’ role had changed from being a shepherd of the people ‘telling them what to do’ to that of a loving friend and companion. Fr Paul said the love of the people helped support and uplift the priests. ‘You are the wind beneath our wings,’ he said.